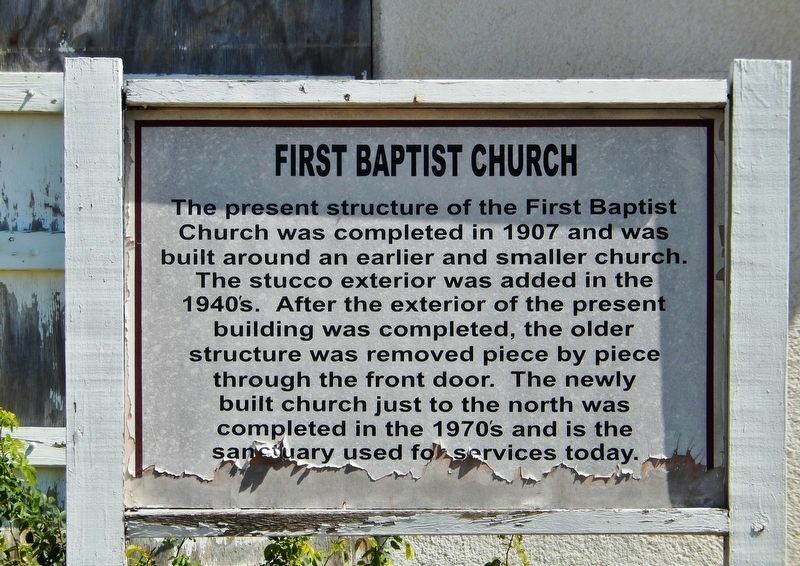 The present structure of the First Baptist Church was completed in 1907 and was built around an earlier and smaller church. 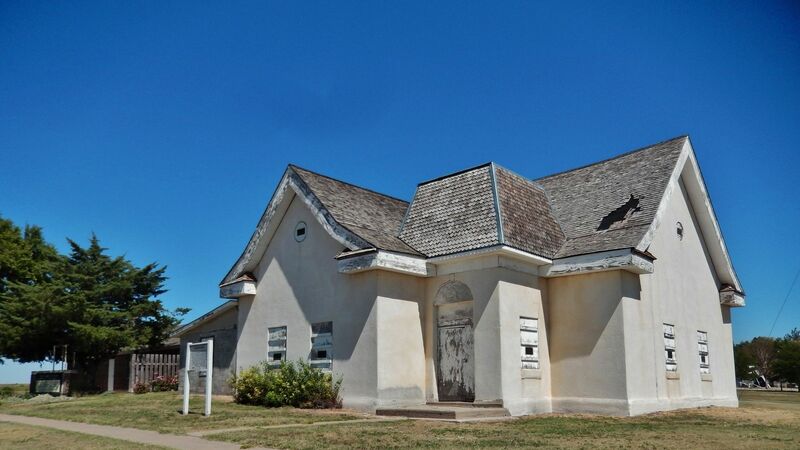 The stucco exterior was added in the 1940's. After the exterior of the present building was completed, the older structure was removed piece by piece through the front door. The newly built church just to the north was completed in the 1970's and is the sanctuary used for services today. Location. 39° 23.599′ N, 99° 37.023′ W. Marker is in Nicodemus, Kansas, in Graham County. Marker is on 4th Street north of Washington Avenue, on the right when traveling north. Touch for map. Marker is located beside the sidewalk, directly in front of the subject building. 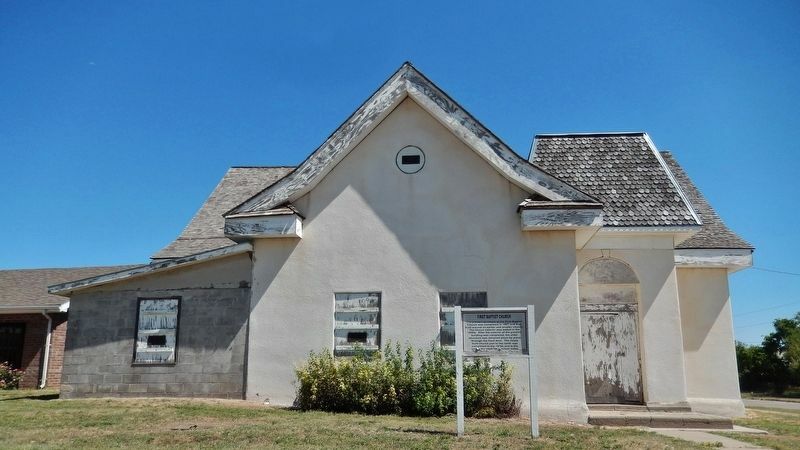 Marker is in this post office area: Bogue KS 67625, United States of America. Touch for directions. Other nearby markers. At least 5 other markers are within walking distance of this marker. Nicodemus Baseball History (about 300 feet away, measured in a direct line); St. Francis Hotel (about 500 feet away); Nicodemus (about 600 feet away); Main Street Boom and Beyond (about 700 feet away); a different marker also named Nicodemus (approx. 0.2 miles away). More. Search the internet for First Baptist Church. Credits. This page was last revised on March 28, 2019. This page originally submitted on March 28, 2019, by Cosmos Mariner of Cape Canaveral, Florida. This page has been viewed 34 times since then. Photos: 1, 2, 3, 4. submitted on March 28, 2019, by Cosmos Mariner of Cape Canaveral, Florida.